Shot in only 24 hours around the New Year's Eve, as reported in the opening epigraph, Krysař marks F.A. Brabec's return to folk legends, following his visually inspired fairy tale omnibus Kytice (Wild Flowers). It shares the title with Jirí Barta's expressionistic stop-motion masterpiece (from which it is only a few minutes longer), whereas its raw, anarchic energy and New Wave-ish attitude make it somewhat comparable to Juraj Jakubisko's then-controversial film Vtáckovia, siroty a blázni (Birds, Orphans and Fools, 1969). Relatively simple in narrative terms, it revolves around the bet between the titular hero (Petr Jákl, bringing stoic physicality to his role) and the Devil (portrayed with manic theatricality by Karel Dobrý). The former is supposed to purify the city (of Prague) from the sinful ones before the stroke of midnight, when the latter plots to reclaim the stained souls of citizens who are completely gripped by the festive mood. However, the beefy musician falls for a lovely (not to mention pregnant) bride-to-be, Agnes (Ester Geislerová, painting her heroine with subtle melancholy and naive saintliness), with her overly possessive, increasingly drunk betrothed Kristián (a commendable performance by Richard Krajco) unwillingly swept into a romantic triangle. 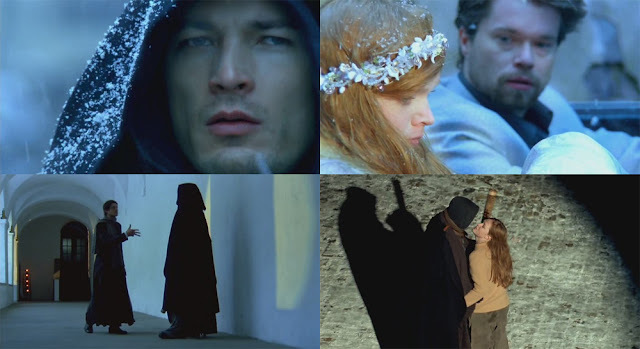 Through the wintry streets of the beautiful, yet deglamorized Czech capital, these archetypal characters are followed by a jovial bunch of masquerading youths (credited as DAMU group and looking as if they walked away from the set of some Jodorowsky's feature) whose costumes are dominated by the foreboding red. Their childlike, or rather utterly infantile behavior has the impish, improvisational qualities attached to it, whereby Brabec directs his rascally 'flash mob' with the playfulness of a jester. Given that his camera is in constant, feverish, disorienting motion, the cinematography comes off as (deliberately?) chaotic or in other words, not as arresting as in Kytice, but the slightly experimental tone of the entire enterprise renders it acceptable, even poetic in a certain way. One prominent (some might say, gimmicky) trait of the 'panicked' visuals is the use of stage spotlight in addition to the available light, which often unnaturally encircles the action and feels like an attempt to break the fourth wall. The restless imagery is accompanied by the eclectic score taken from the musical of the same name written by Daniel Landa, the tracks ranging from accordion ballads to rock anthems which establish a peculiar atmosphere.